The hardest part about this gingham stitch is shopping for the yarn. I’m serious. You’ll need to find two colors that are in the same family but separated by a few shades. And sometimes when you hold the skeins together, you still won’t believe the colors will work. I experimented with Caron Simply Soft in light pink and strawberry and I feel like I have a good representation of pink gingham! Whew! Chain a multiple of 10 plus 1. If you use this yarn, 130 base chains is approximately 36 inches wide. (It does depend on your own tension, are you tight? or loose?) But also, either do 130 +1, or 110 +1, (not 120 or 140) chains. Each block is ten wide and I like to have the starting color the same as the ending color. Change hook size to (J), join light pink color with the chain one and turn. Start your next ten. SC with pink, crocheting over the white yarn, when you get to the tenth SC, do not finish all the way with pink, stop, pull up the white, pull through, and now do the next ten SC with white, crocheting over the pink. That is all this is!! Continue changing colors every ten stitches. Do ten rows. At the end of your tenth row, you’ll cut off the white, add in the strawberry, and alternate between strawberry and light pink. (You will be weaving in the white end, do not crochet over the white, you’ll join that back in after ten rows). 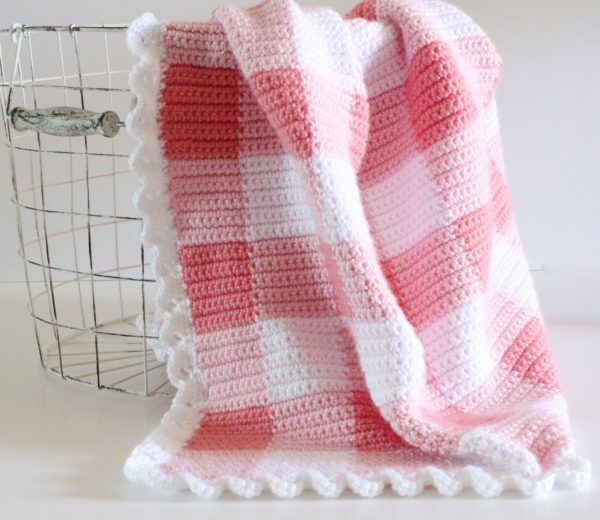 Click here to see the full pink gingham crochet blanket! And click here to see more crochet gingham blanket patterns in different colors!